We receive many emails and phone calls from people who are interested in owning a Bernese Mountain Dog. They all have basically the same questions so we have put together a few of the most frequently asked questions and answers. We want to buy a puppy next month – where can we get one from? If it could only be that easy! The Bernese are not that easy to breed, possibly due to the relatively small gene pool in WA but Breeders are working on this by importing new bloodlines. Breeders usually have a list of PPOs (Potential Puppy Owners) so it is advisable to contact the Bernese Mountain Dog Club of WA to obtain a list of Breeders in WA. How do we get on the List ? Contact the Breeders by email with a little about your situation ie. If you have children, is there someone at home during the day to take care of the puppy, do you both work all day, do you have other pets etc. The Breeder will then contact you to discuss if and when they will be having another litter. Even if you put your name on the list you are not under any obligation to buy a puppy. How Long do we have to wait ? As discussed above, it depends on how many are on the list. This said, the list of people move around and when it actually comes to contacting people to see if they are still interested, some have changed their minds, bought another breed, or from another Breeder or circumstances changed etc. 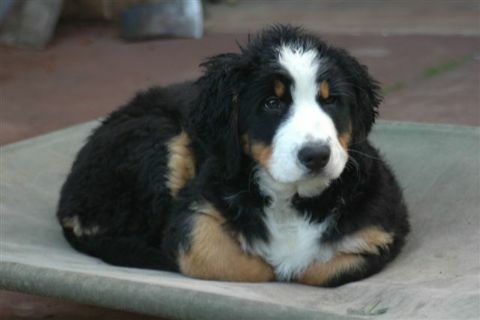 Are there ever any fully grown Bernese for sale ? Rarely ever, but it does happen from time to time. Contacting the BMDC of WA is the best way to find out as usually re-homed or rescue dogs will go through the Club. Do the Bernese come in different colours ? No, they are Tri-coloured and that is the Breed Standard, but they can have more white markings or less white markings. Do they make good Guard Dogs ? Bernese are essentially a Working dog and Family dog. They are good Watch Dogs and will let you know if there is someone or something around the home they want to draw your attention to. If you are happy with the person or situation and let them know it is “o.k” then they will quickly accept this and settle down. Are they easy to Train ? Bernese are generally easy to train as they love to please their owners. They respond best to the softer approach of training, with treats and lots of praise. They are sensitive dogs and do not like aggressive voice tones. How often do we have to groom them ? A good brushing once a week is good for them and makes a good bonding time as well as checking for any problems ie. Ears, Paws for grass seeds and cracks, Coat for grass seeds and signs of skin problems, Teeth etc. It also gets them used to being handled for future Vet visits. Most Bernese are happy around water so bath time can be part of a play situation, starting them off when young puppies using the garden hose gently on the lawn and or an old bath. No strict rules about how often but it is nice to keep them clean. Every 2 or 3 or 4 weeks. Do we have to sign a Contract ? Abbiberne Bernese have an Agreement which is signed by the Breeder and the Buyer. Basically it is to protect the breed. Puppies are sold with papers on a restricted register and are in the Breeder’s name for the first 12 months. At 12 months the puppy has to be x-rayed for Hip & Elbow scores. At this time they will be sterilized and papers sent back to the Canine Association of WA to transfer the dog in to the Buyer’s name. Do we have to show the puppy ? No, all our puppies are sold as pets. We have Breeders and Show people who are particularly waiting for a show quality puppy from us for the bloodlines. Other than this our puppies are placed in to loving homes. If you would like to show your puppy then of course we are more than happy to help you start off. Show training is available at the Canine Show Grounds in Southern River. How do they cope with the Summer, do we have to cut their hair short ? No, they do not need their coats cut short for the hot weather. They have a double coat of which one is for insulation. Air can circulate between these two layers and keeps them cool. But obviously as with any animal, they need several shady areas and PLENTY of water. So two or three large containers of water around the garden will ensure they don’t become dehydrated. Are they good with other animals ? Yes they are happy with other dogs and cats etc. especially if they grow up with them. We are at work all day does that matter ? Bernese are Family dogs. They do not thrive at all well being left outside all the time. They do not like being left on their own all day. They get bored and become destructive and timid and develop behavioural problems. They do not respond well to being in solitary confinement for 8 or 9 hours a day. If this is your situation then realistically the Bernese Mountain Dog is not the breed for you. They are sociable dogs and love to be part of the family for companionship. Have a look at the photo above of Berry when she was 12 weeks old, then think about leaving a puppy like this all day on its own. All breeds have problems of some sort, some more than others. As with some of the larger breeds, Bernese are prone to Cancers and Hip and Elbow Dysplasia. However with careful breeding responsible Breeders are working towards reducing this problem.